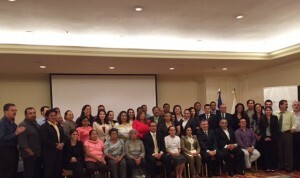 SAN SALVADOR, EL SALVADOR – On June 8 and 9, 2015, AIPR joined with the Salvadoran Office of the Ombudsman for the Defense of Human Rights to initiate the first workshop-seminar on Tools for the Prevention of Genocide and Mass Atrocities as Grave Violations of Human Rights in El Salvador. The goals of the workshop included promoting reflection and discussion among national public officials and representatives of civil society regarding the importance of prevention as well as the identification of suitable roles for each as relevant actors in society. Participants of the activity came from various Salvadoran government organisations, including the offices of the Ministry of Defense, National Police, Ministry of Foreign Affairs, National Judiciary, and the Institute of Forensic Medicine, as well as from Salvadoran human rights NGOs. atrocity, pertinent legal frameworks, and existing national-level and regional-level tools for prevention. Featured in this segment was Prosecutor David Morales, who gave a presentation on the national-level challenges that El Salvador faces on the subject of memory, truth, and justice. He identified himself to the Latin American Network as a concrete tool of intergovernmental coordination. The workshop also included the participation of Mariam Ábrego, a victim of the armed conflict in El Salvador, representative of the Madeleine Lagadec Center for the Promotion of Human Rights, and tireless defender of truth, justice, and human rights. During the second day, a representative of the United Nations Office of the Special Adviser on the Prevention of Genocide presented the analytical framework developed by his office as a concrete tool for early warning in the context of the United Nations. 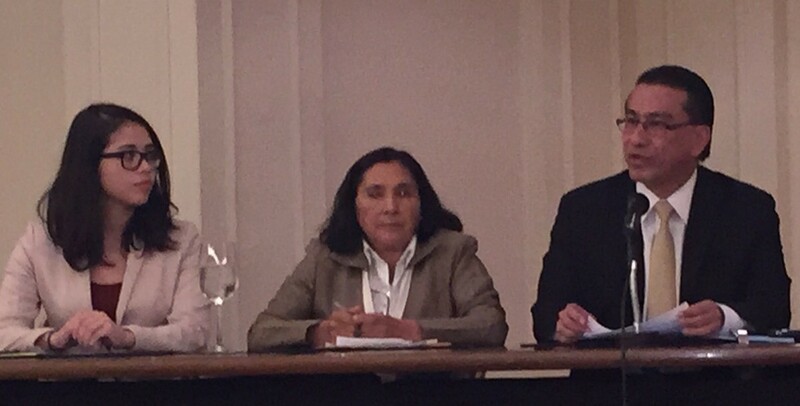 In the spirit of fostering the cooperation and multilateral exchange which inspired the Latin American Network’s formation, seminar participants contributed to the development of a segment, as a part of the established framework, that considers the experience of the Republic of Argentina on the subject of Memory, Truth, Justice, and Reparations. The workshop was then concluded with an opening of the floor to participants, who were all invited to share ideas and suggestions towards the formulation of a common agenda. 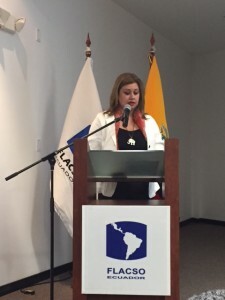 On Thursday, June 11, 2015, The Auschwitz Institute for Peace and Reconciliation and Yudith Rolón, Paraguayan Focal Point of the Latin American Network for the Prevention of Genocide and Mass Atrocities, participated in the first panel discussion on transitional justice in the construction of processes of reparations to victims, which was organized by the Ecuadorian Ombudsman Office. Over the course of the activity, participants shared their experiences regarding the legislative adoption and observance of the Law for Victims’ Reparations and the litigation of human rights violations and crimes against humanity that occurred in Ecuador between the 4th of October, 1983, and the 31st of December, 2008.
he discussion included the participation of AIPR Raphael Lemkin Seminar alumnus and National Assembly member José Guerra Mayorga, the General Director of the Ecuadorian Office of the Ombudsman as well as Ms. Rolón, who shared her experiences with the Truth Commission in Paraguay and the actions undertaken by the country’s Office of the Ombudsman to carry out the 177 specific recommendations identified in the resulting report. On June 12, AIPR and Ms. Rolón held a workshop entitled Prevention of Genocide and Transitional Justice, which served to benefit public officials within Ecuador’s Office of the Ombudsman. The workshop aimed to give officials important concepts and materials related to genocide prevention. 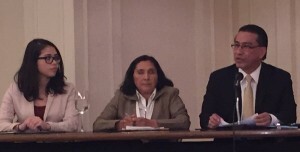 Yudith Rolón led the afternoon sessions, which focused on Paraguay’s experience with memory, truth, and justice and the country’s participation within the framework of the Latin American Network for the Prevention of Genocide and Mass Atrocities.